Today’s distribution was windy, rainy, and cold, something fairly unusual for Arizona! I was very close to turning on the air conditioning earlier this week, but had to turn my heat back on today. I’m trying to figure out if it really is mid-April! But, moving around, filling up baskets was a great way to keep warm and there was a great group of volunteers who still made it all happen despite the weather. 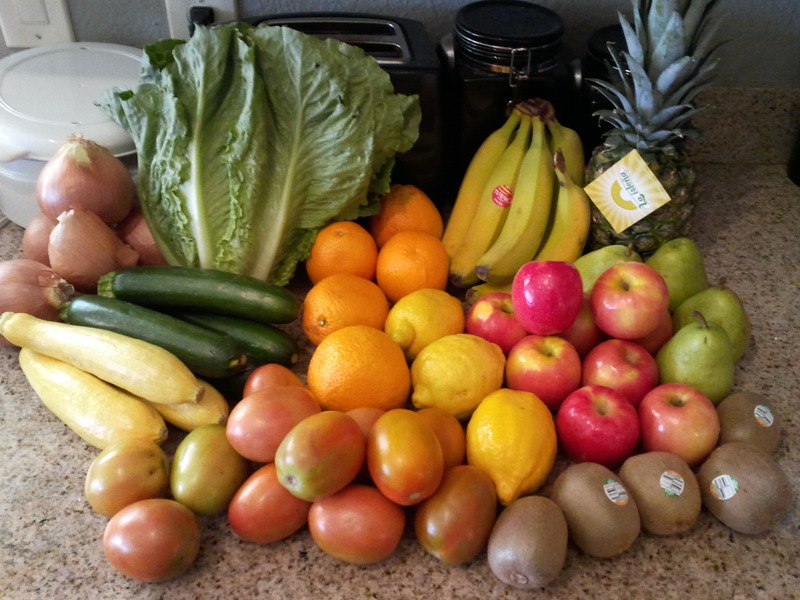 My basket had yellow onions, Romaine lettuce, zucchini, yellow squash, Roma tomatoes, oranges, lemons, bananas, pineapple, pears, Pink Lady apples, and kiwi. 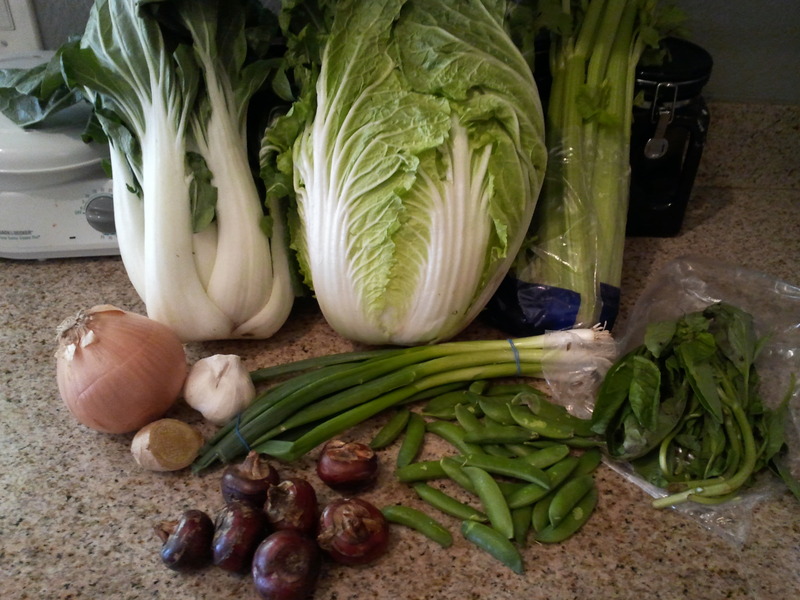 Bok Choy, Napa cabbage, celery, yellow onion, garlic, ginger root, green onion, water chestnuts, peas, and basil. Chinese Napa Cabbage Salad – One of my favorites! Also uses green onion. Stir fry to go along with Sesame Chicken, Orange Chicken or Lemon Chicken, using Bok Choy, water chestnuts, peas, onion, and ginger. 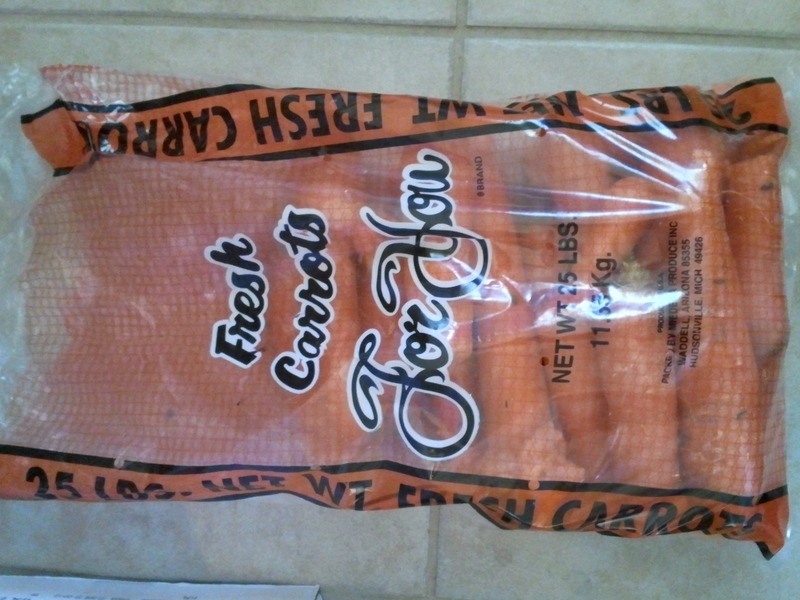 Finally, here is one of the 25 lb bags of carrots. One of these bags is going to my friend for her horses. The other bag is for me, and I plan on cutting a lot of them for snacks for us, making a Carrot Cake, using them in the stir fry I mentioned above, and in soups/stews, like Slow Cooker Chicken and Noodles and Broccoli Cheddar Cheese Soup. Note: The type and amount of food may vary from another basket because of geographic location and because of variances in how the ends of produce cases are distributed after everything has been distributed evenly. I also volunteered this week and got 1 extra item for volunteering. This post is participating in a LinkUp Party with Healthy Mom’s Kitchen to share recipes and menu plans using Bountiful Baskets items. From left, oranges, bananas, altaulfo mangoes, pineapple, apples, Romaine lettuce, cucumbers, asparagus, carrots, sweet peppers, green chiles, green onions, and kale. In the Asian themed veggie pack, from left, snow peas, Napa cabbage, onions, garlic, ginger root, Bok choy, water chestnuts, celery, green onions, and Thai basil. I’m working on what I will make this week. My parents are in town visiting and we have 3 birthdays to celebrate this week, my daughter’s, my mom’s, and mine, so I’m not sure how much cooking at home I will do. But, I will share what my meal plan is if I make one! Note: The amount of food may vary from another basket because of variances in how the ends of produce cases are distributed after everything has been distributed evenly. I got a lot this week! I got the conventional basket for $15, the Asian themed veggie pack for $8.50, the case of Pink Lady apples for $22.50, and the 25 lb bag of carrots for $8.50, making my total $56. I did split the apples and carrots with a friend, who is sharing her honey with me in return (12 lb bucket was $37.50). Conventional basket had minneolas, yellow onion, apples, blueberries, green peppers, red peppers, tomatoes, green beans, asparagus, cabbage, lettuce, and baby red potatoes. 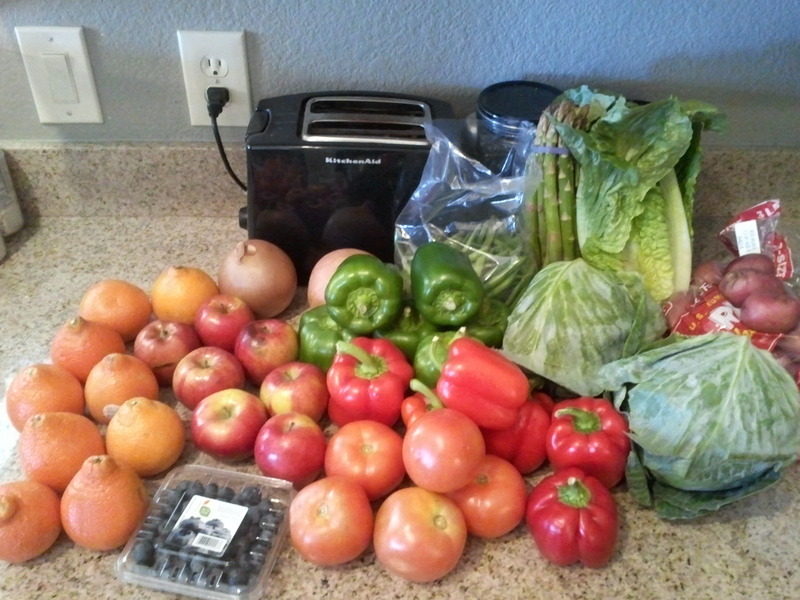 Not shown is 3 grapefruits, which I gave to a friend because she gave me her cabbage and some peppers. 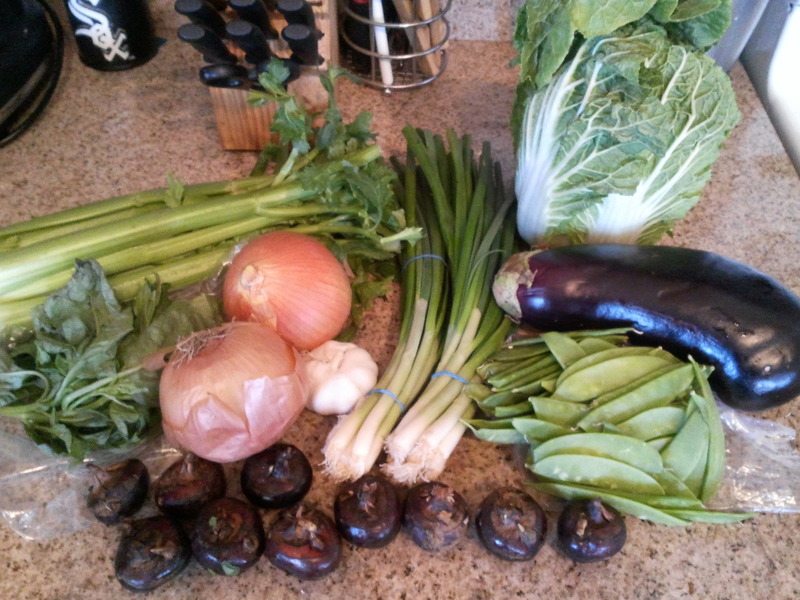 Asian themed veggie pack had celery, basil, yellow onion, garlic, water chestnuts, green onion, Napa cabbage, eggplant, and snow peas. Not shown is bok choy, which I gave to my friend for her mom’s pack, since hers was small and not looking real good and I have plenty left from last week’s inherited Asian veggie pack. 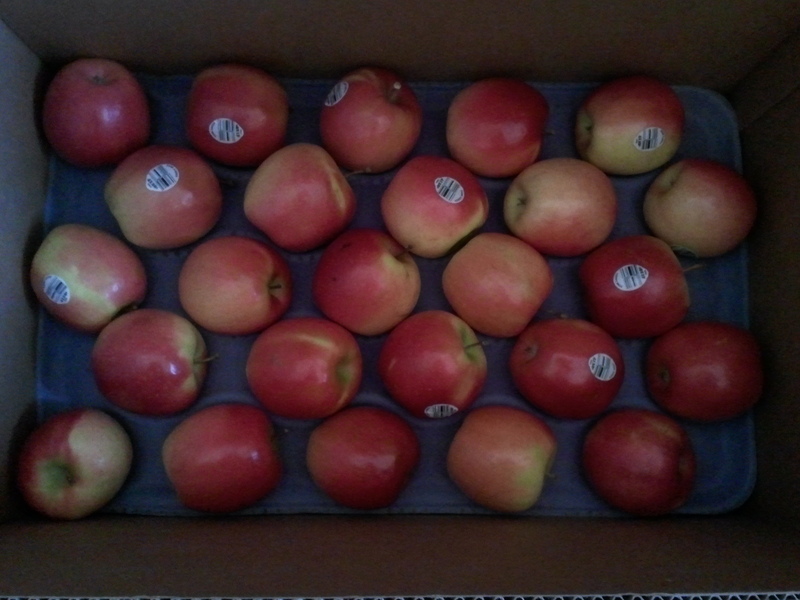 One layer of Pink Lady apples. There is another full layer underneath this, plus another 5 apples. There are usually 100 apples in the boxes of apples available. I have half, my friend has the other half. 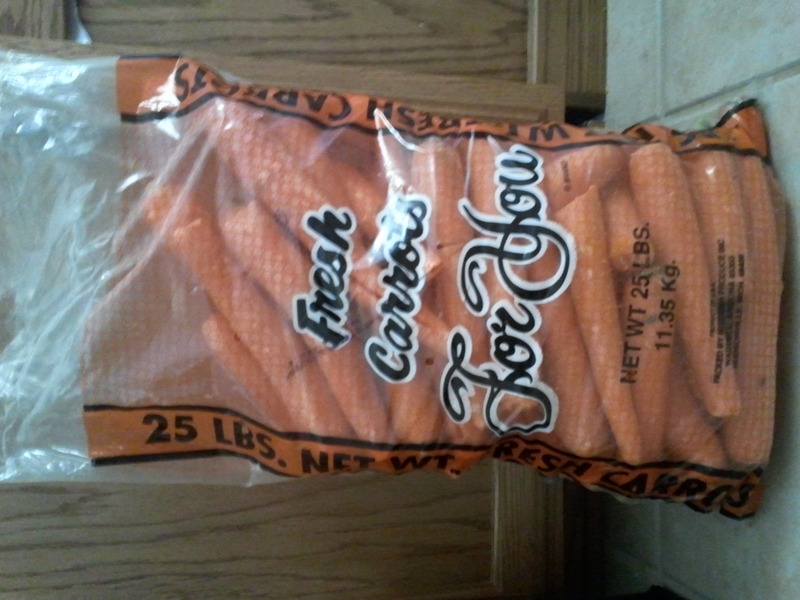 About half the 25 lb bag of carrots. These are huge! My friend has the rest. I don’t have a picture of the honey yet. It came in a bucket, so my friend is going to get it split into other containers. Can’t wait! 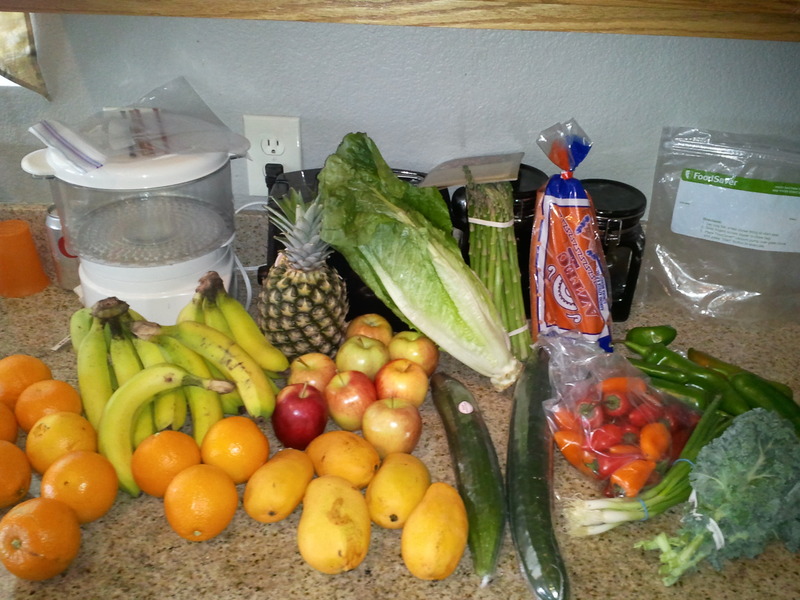 I am working making room for all this in my fridge and decide what to make with all of it. Hopefully, later today or tomorrow, I will have my meal plan for the week with this week’s basket. Note: The type and amount of food may vary from another basket because of geographic location and because of variances in how the ends of produce cases are distributed after everything has been distributed evenly. More Bountiful Baskets for this week! A friend of mine was feeling overwhelmed with her extra Asian themed veggie pack, so asked if I wanted it and I decided to take it. She already used some of the items, but still plenty left! 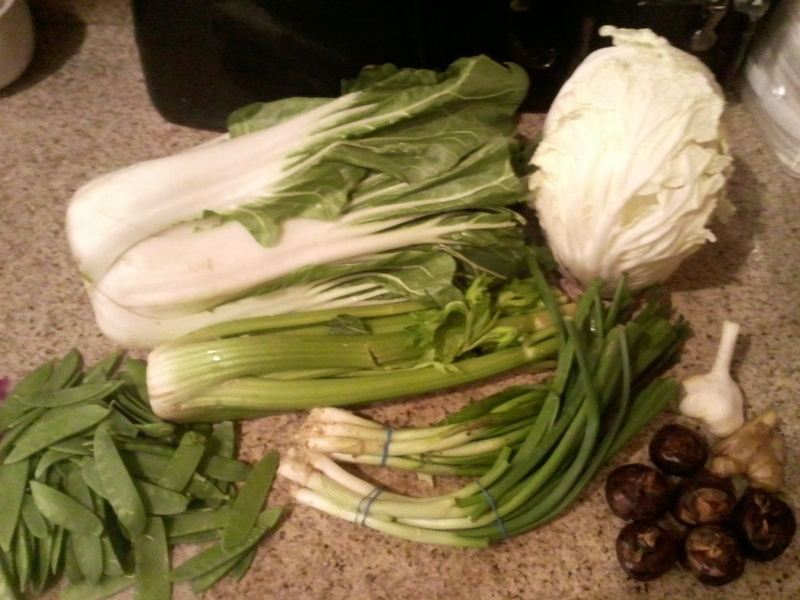 There is bok choy, Napa cabbage, celery, snow peas, green onions, garlic, ginger, and water chestnuts. I’m think that I will use most of it to have as stir fry veggies with the Orange Chicken I am planning on making at some point this week. I will probably also make Chinese Napa Cabbage Salad. I’ve never actually seen whole water chestnuts before, so thankfully someone on the Bountiful Baskets Facebook page posted this article on how to slice and peel them. I’m excited to get to work with something new. A few weeks back, I made egg rolls for the first time. 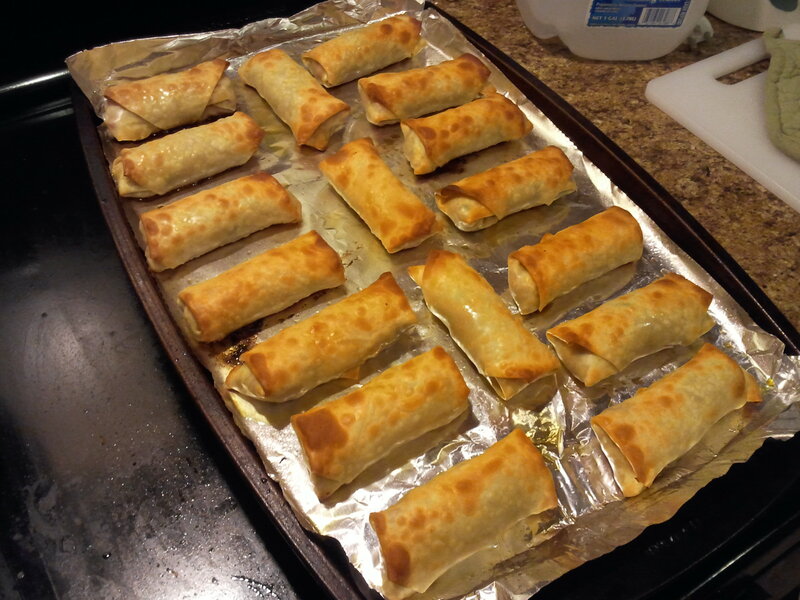 I had another package of egg roll wrappers still, so I decided I wanted to try baking them instead of frying them. For the filling, I julienne cut one of the 1 pound bags of carrots I got from Bountiful Baskets this week. 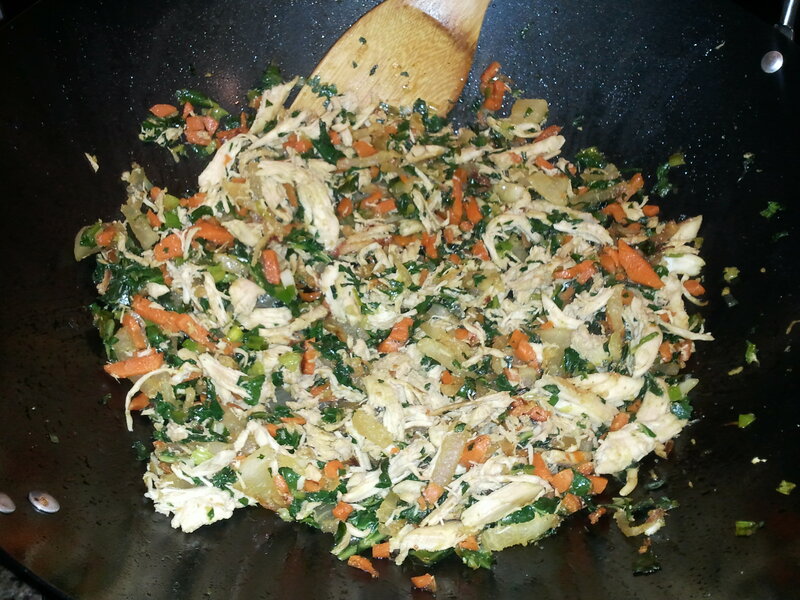 Next, I diced up the stems and leaves of the bok choy, then removed the meat from the bones of the rotisserie chicken. I put a little vegetable oil in my wok, then added the carrots and the bok choy stems. 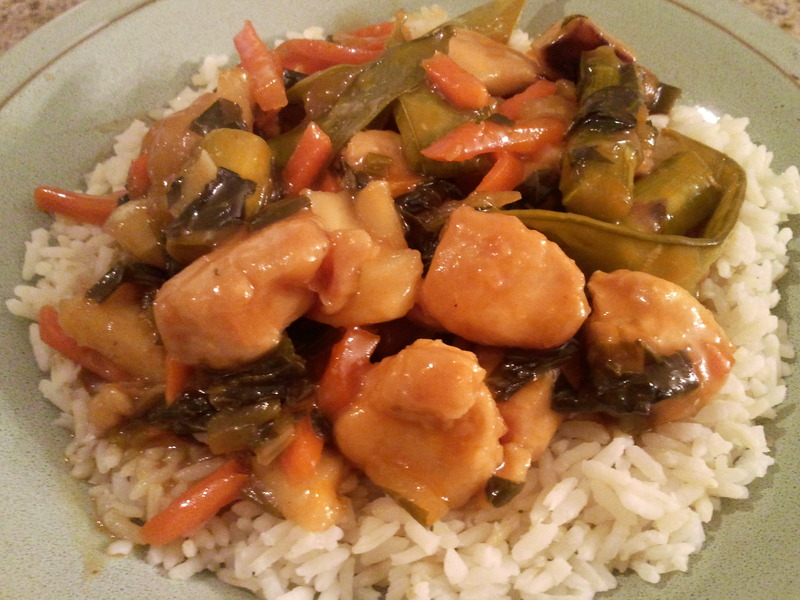 I cooked them until they were tender, then added the bok choy leaves and the chicken. I added in soy sauce, and cooked for a few minutes. 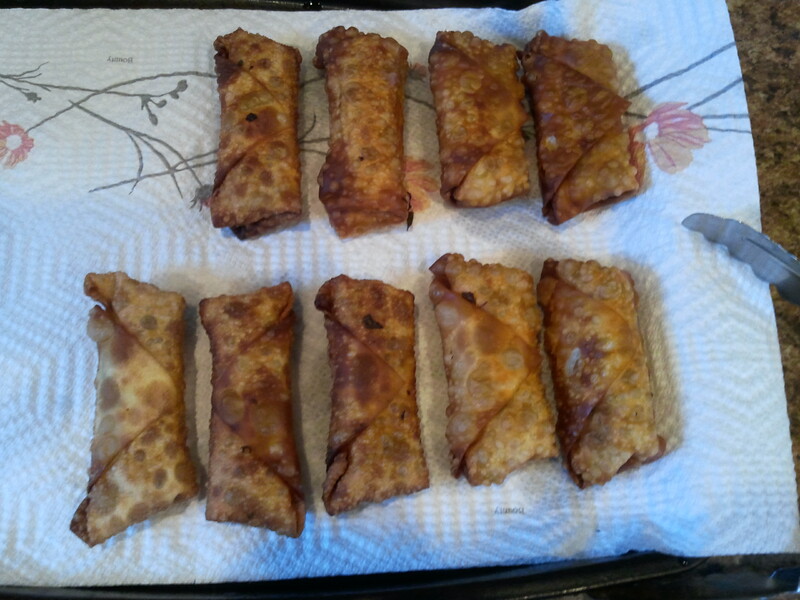 Then, I assembled the egg rolls. To bake them, I lined a baking sheet with aluminum foil and sprayed it with non-stick cooking spray. I arranged the egg rolls on the baking sheet, then brushed them with olive oil I put them in the oven at 400 F for about 15 minutes, when they became golden brown. They turned out well. I think I prefer them fried, but have no problem with the baked ones. After I used up the filling, I still had 4 egg roll wrappers left, so I filled them with shredded mozzarella cheese, and baked them the same way. They turned out pretty tasty too. In my quest to figure out what to do with all the daikon I got, I came across this recipe for Pan Fried Daikon Cakes. 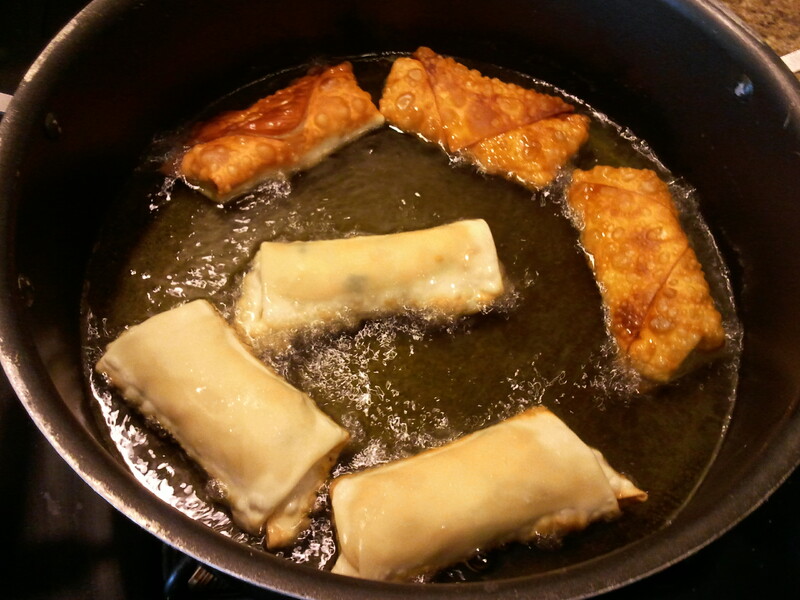 Since I had oil hot for frying my egg rolls the other night, I decided to make these as well. I left them in a little too long, I was trying to do too much at the same time. 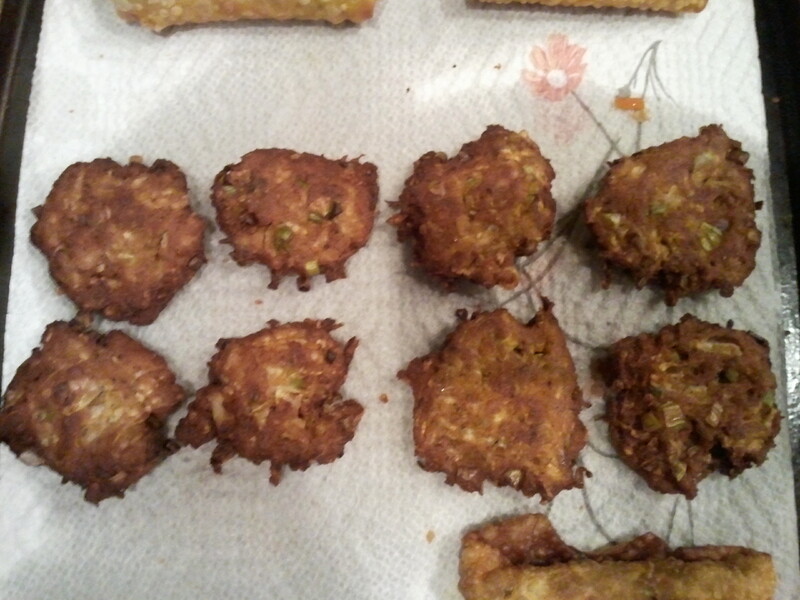 However, they actually turned out pretty tasty, a little hot for my taste buds with the Sriracha sauce, but good enough to make some more to use up the daikon, which I still have a LOT left. I have been working all week on a way to use the daikon radish I received in the Asian themed veggie pack that I bought with my Bountiful Baskets this week. 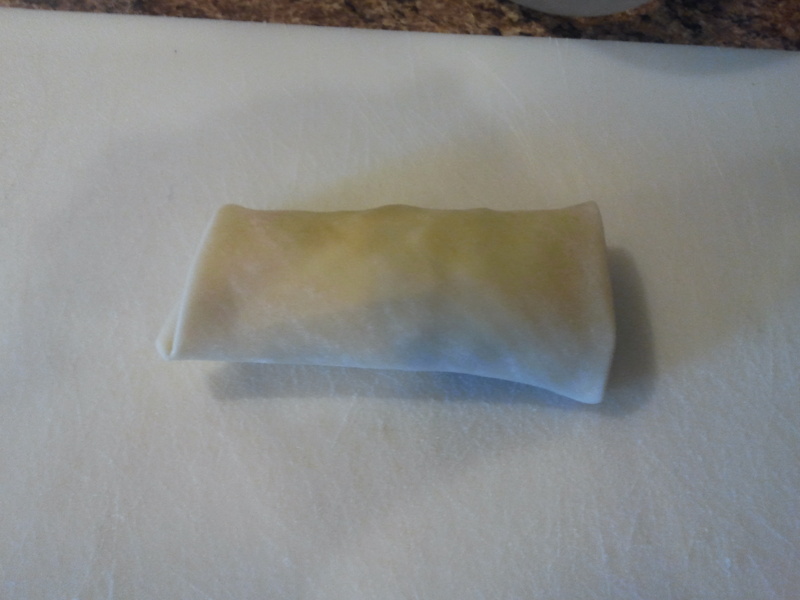 I decided I would try egg rolls, which I love, but have never made. 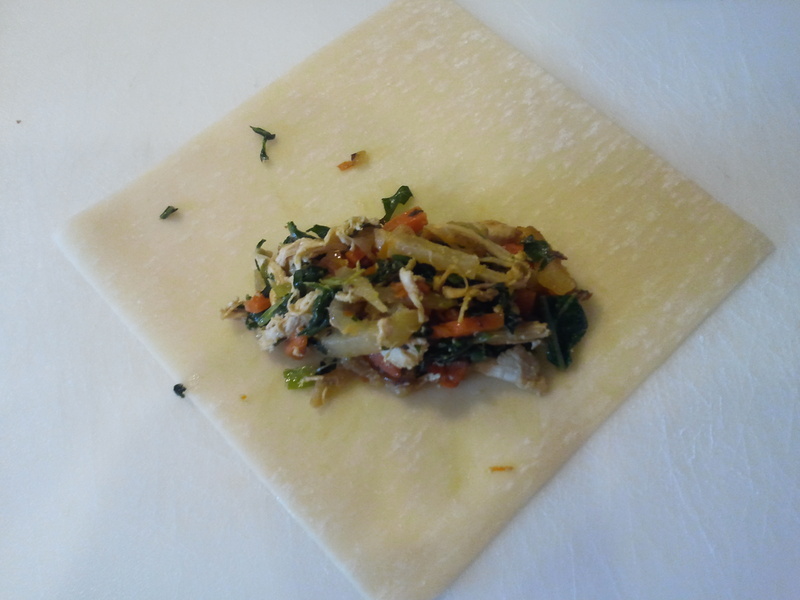 For the filling, I julienne cut some daikon and some carrots. 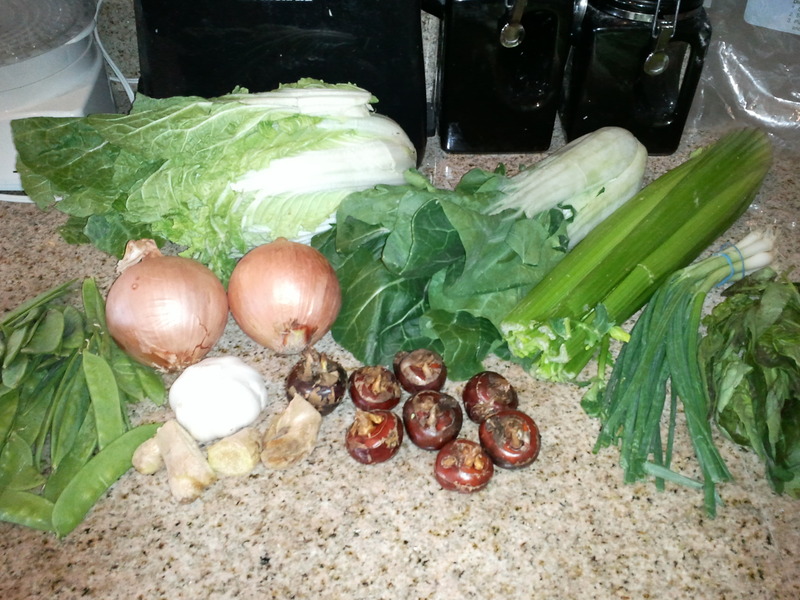 Then, I chopped 1 bunch of green onions and some leaves of bok choy. I had bought a rotisserie chicken at Fry’s since I had a $2 eCoupon, so I removed the chicken from the bones and shredded it. I added some vegetable oil to my wok, and put the daikon, carrots, and green onion in first. 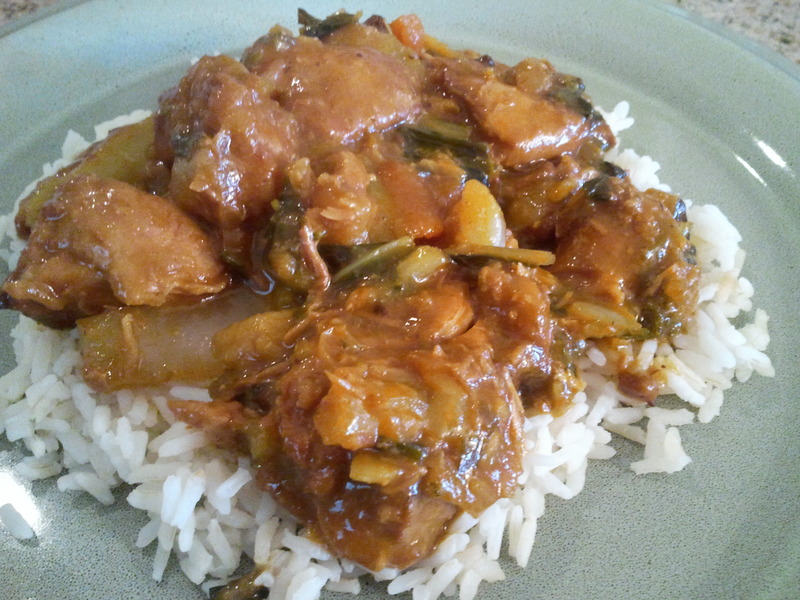 Once they started to get tender, I added in the bok choy and chicken. Once the bok choy started to wilt, I grated fresh ginger into the wok and poured in about 2 Tbsp of soy sauce. It looked like this. Next comes the egg roll wrappers. I found mine in the produce section of the grocery store, they may also be in your freezer section. You take a wrapper and lay it out, then add some filling. For this size wrapper, it was about 2 Tbsp of filling. 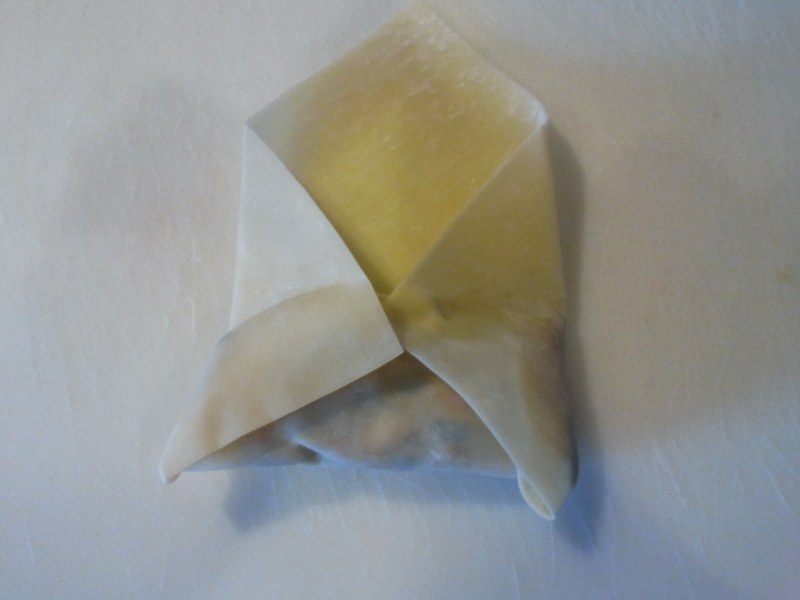 To fold the egg rolls, my previous experience as an employee at Subway wrapping sandwiches in paper came in handy. It’s also how I roll my stuffed grape leaves (that recipe will be coming hopefully in the next week). Notice in the picture above how I placed the filling closer to one corner. The first fold is to bring that corner up over the filling. 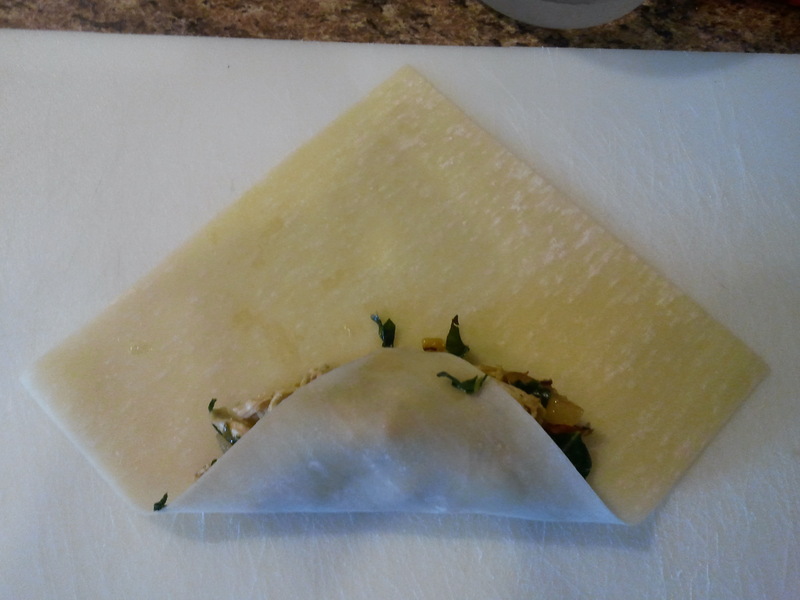 Next, you fold over both sides. Then, you roll it and brush the tip with a little water to make it hold shut. Then, you deep fry or add about 1/2″ of oil to a pan. If your oil doesn’t completely cover the rolls, then you need to flip them when one side is golden. Remove rolls from oil to a baking sheet lined with paper towels. This made 11 egg rolls. I still had wrappers in that package, so I made more filling. The second filling was all veggies, bok choy leaves and stems, julienne cut carrots, julienne cut daikon, and chopped yellow onion, then grated ginger and soy sauce. This made 7 more egg rolls. They turned out great, both my girls ate 2 each! As soon as I saw the Asian themed veggie pack was available from Bountiful Baskets, I was seriously hoping that Napa cabbage would be included. I was craving Chinese Napa Cabbage Salad, and once I found out it was in there, I got the rest of the ingredients I needed ready. Heat a medium-sized skillet over medium-low heat. Melt butter and add crush noodles. Cook until golden brown. 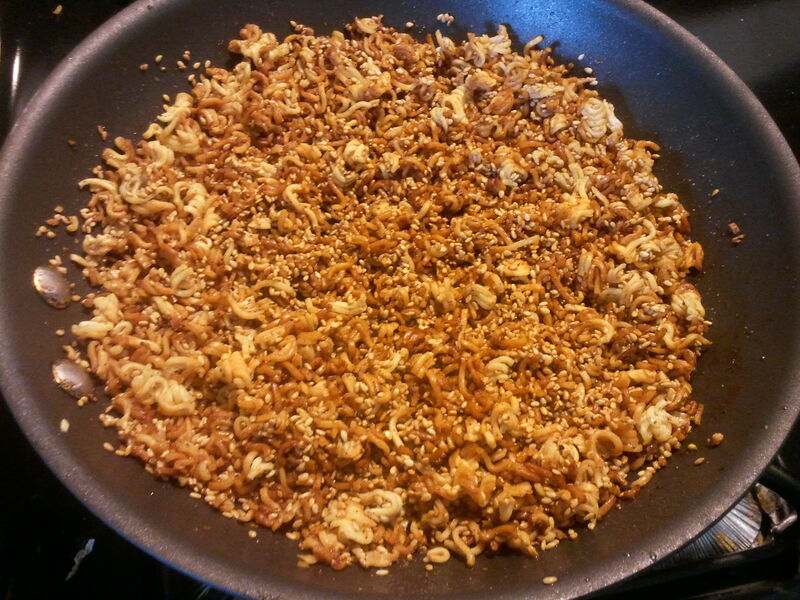 Add in toasted sesame seeds and 1 of the seasoning packets from the ramen noodles, stir thoroughly. Remove from heat and allow to cool. 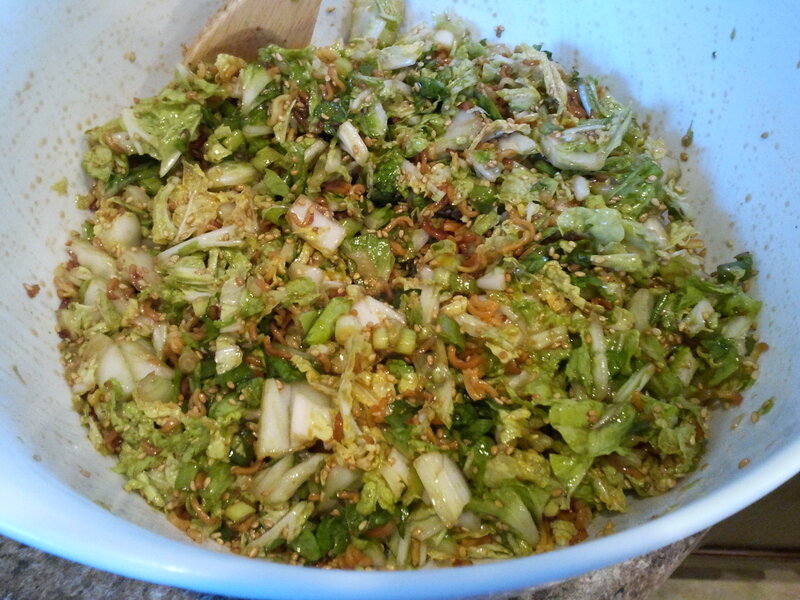 In a large bowl, add cabbage, green onion, chicken (if using) and the cooled noodle and sesame seed mixture and mix. Set aside. Mix together the remaining ingredients in a separate bowl. Pour this over the cabbage mix and toss. Serve immediately.